Derivan Block Ink Medium Extender is a versatile medium that can be used in two ways to create relief prints. Add Derivan Block Ink Medium Extender to extend the colour without diluting the structure of your paint. Up to a 1:1 ratio the colour will be extended, after this the colour will start to become more transparent. 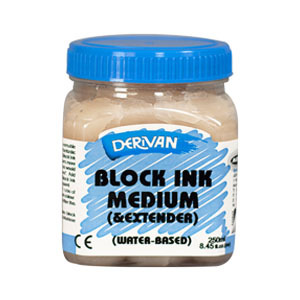 Derivan Block Ink Medium Extender can also be added to Matisse Structure Acrylic colours to create block printing ink. A ratio of 1:1 is recommended.